Bonus for this authentic recipe: apples are easy to find most everywhere and certainly easier to find in the US than quinces or sour cherries, two of the most traditional spoon sweets. The apples most often used in Greece for this dish are small, tart apples called firikia. Not having access to firikia here in the Northeast US, I most often use jonagold or granny smith apples. 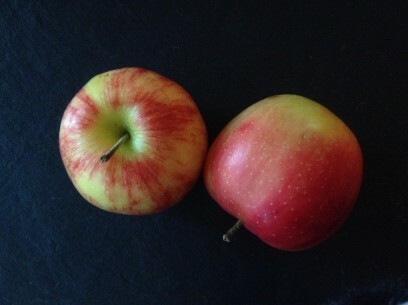 A nice tart apple with just a bit of sweetness is ideal so feel free to use whichever local varieties fit that bill! Firikia are small enough so that they are often preserved whole. As local apples are a bit large to keep whole, this recipe uses thick slices of apple instead and they’re every bit as wonderful, I promise! Important to remember when making spoon sweets – the natural taste of the fruit should rise above the overall sweetness of the preserves. You want to taste apple here and not just sugar! NOTE: the apples in this recipe can be easily interchanged with tart pears and with quinces, when you can find them. The syrup flavor is lovely with all of these fruits. As you are peeling, coring and slicing the apples, remember to keep your slices approximately 2-3″ thick and to keep them aside in a bowl of water with a generous squeeze of lemon juice to help keep their color. And it may seem like lemon juice overkill but remember to add a bit to your syrup too – keeps the sugar (or honey) from crystalizing and gives you a nice smooth syrup. I start my syrup going before working on the apples, which takes about 10 minutes or so depending on the apples. This way, the syrup has plenty of time to reach a gentle boil and get almost syrupy while I’m peeling, coring and slicing the fruit. 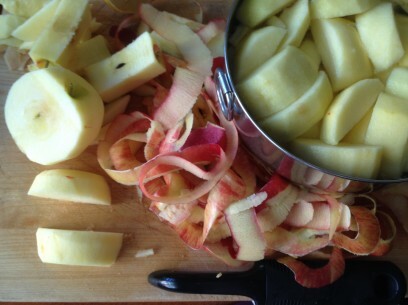 Then when I add the thickly sliced apples, it’s just 10 minutes and the whole recipe is done – no time wasted here! The syrup is simply flavored with vanilla beans, a few whole cloves, a strip of lemon peel and cinnamon sticks and cooks up in no time. 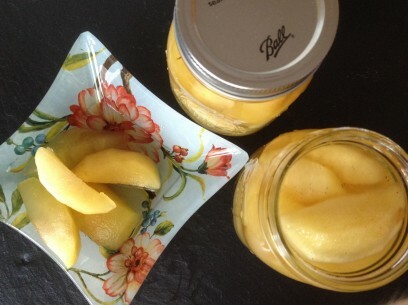 Truthfully, honey is the most traditional sweetener for preserved fruits but if you don’t eat honey or feel more comfortable cooking with white sugar it works just fine too and is what I’ve used in this recipe. I have seen recipes that call for corn syrup for some reason but it’s not necessary here and certainly not found in authentic spoon sweet recipes. A nice thing about using thick slices of apple as opposed to whole is that the cooking time is ‘sliced’ down to 10 minutes 🙂 Slices also allow you to use a more shallow pan. I like to use my 3 quart saucepan – it fits 12 medium sized apples well. Just be sure to use a large enough pan to hold both syrup and apples without spilling over onto your stovetop. If it looks a bit full after you add the apples just ladle some syrup out until you have a manageable lever. Sugar syrup is STICKY and burns with acrid, black smoke when it hits the hot stovetop! Do try and skim off any foam that rises to the syrup’s surface during the 10 minutes the apples are cooking. That helps to keep things neater too! And gently submerge the slices regularly during their cooking time. My yiayia used to lay a plate on top of the fruit to keep it from bobbing to the surface but I’ve never managed to make that method work myself. Once the apples are cooked and tender but not mushy, remove pan from heat and carefully strain apples out of the syrup with slotted spoon – hot syrup is not fun to get on you so go slow! Place cooked apple slices gently in a bowl to cool, allowing about 10 minutes or so for both the apples and syrup to cool down a bit. Fill jars with apples first, about 2/3 full and then ladle in the warm syrup. Leave the jars open to cool for another 30 minutes or so before closing tightly. I most often use 16 oz mason jars but you can certainly use what you have on hand. I do like hinged lid jars for spoon sweets too – easy to open and close! 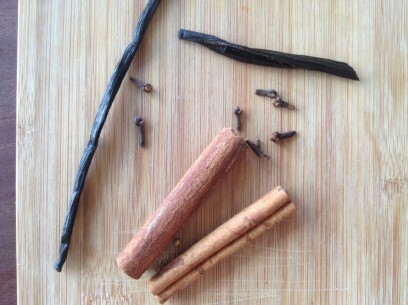 Start your syrup first by combing water, sugar, cinnamon sticks/vanilla bean/cloves/lemon peel together in pot. I often use my 3 qt saucepan for this. Heat on medium until you get a gently boil. This should take about 7-8 minutes. Keep at gentle boil until you add the apple slices. While syrup is cooking – peel, core and slice apples into 2-3 inch thick slices. No skinny slices here! Keep them in a bowl of cold water with a good squeeze of lemon juice until ready to use. Add slices to gently boiling syrup and cook (uncovered) for about 10 minutes until apples are soft but not mushy – careful not to overcook! As apples are cooking, gently submerge them regularly as they bob to the top. If syrup level starts to come close to the edge of pan after adding apples, simply remove some of the liquid from pan until you feel it’s safe. 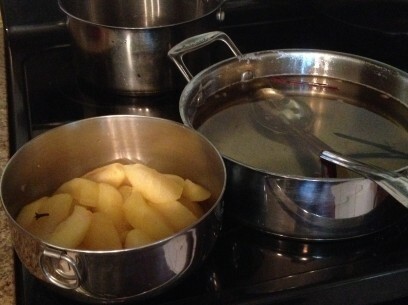 Remove pan from heat and carefully strain out apples with a slotted spoon. Allow about 10 minutes for both apples and syrup to cook slightly. 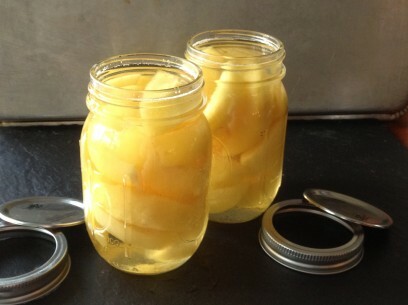 Carefully place cooked apple slices into clean glass jars about 2/3 full. Ladle in syrup until jar is full and all slices covered. Keep filled jars open for about 30 minutes until they’ve cooled sufficiently to close tightly. You may have to push down any bobbers under the syrup at the very top before screwing on lids. Serve with cold glass of water to cut the sweetness! And save a cup or so of syrup (cooled of course) and add to a a few teaspoons to a glass of sparkling water or orange juice or spoon it onto toast, YUM! FULL DISCLOSURE: these are not canned in a water bath after filling and are simply kept in a cool, dark cabinet and in the fridge after opening. I know there are people who swear if you don’t boil bath your ‘canned’ fruit that it will make you sick but I have eaten these spoons sweets all of my life and never gotten sick or known of anyone who has so proceed as you wish. You’re looking for a ‘simple syrup’ here so technically you could replace the white sugar 1:1 with honey. Please let me know if you try it and how it turns out? I’d love to add your experience to the recipe above for any one else looking to substitute for sugar! My daughter Marianna sent me a few of your recipes, Ms. Kiki the Greek Vegan. Apricot cake today lead me to read more about you. Congrats to you for your wonderful blog. Greeks have been vegan since ancient times! Some days vegan, some days carnivores, some days pescaterians. My take on your apple recipe…. more like a Composta Gr (Compote Fr) than a spoon sweet which would be very thick and syrupy. I remember when Yaya or Mama would serve real spoon sweets (Visino or sour cherry hand pitted, kidoni or quince that Daddy would peel and chop, or the one my Mother in Law Magdalini in Athens made and added almonds, or portokali or achladi) in a very small chrystal or silver dish, about 3inches max in diameter with a demitasse spoon, always accompanied by a tall glass of cool water, a nice Greek Loumidis coffee really maxes out the experience. Still very popular in towns and villages in Greece. I have some unripe apples that fell from my tree and was wondering if I could use those in this recipe. I read that unripe apples can be eaten when cooked with no problem. They are quite small and might be a good option. I saw some recipes that add also Brandy, Nora Carey’s out of this world “Beaujolais Pears with Cassis and Prunes” cooks the pears whole in wine + sugar (no water) for 20 minutes. It is to die for. 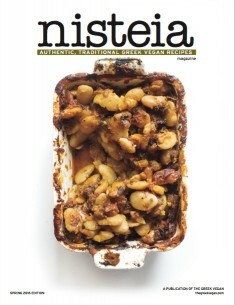 I was considering adapting this recipe of yours and using a large Piesporter bottle I have… Your thoughts?